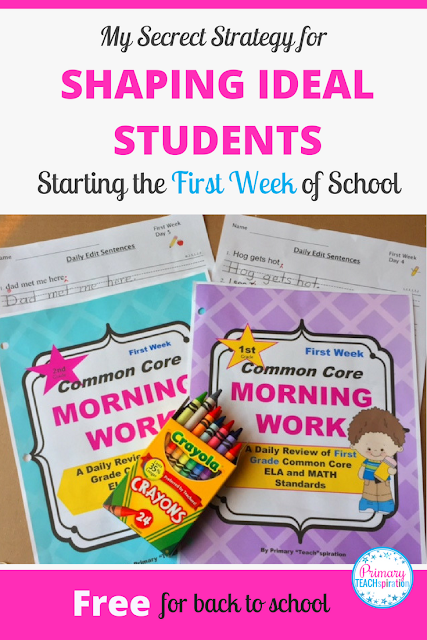 As veteran teachers know, well planned strategies for the first week of school sets the tone for the rest of the year. The first week is the time to begin shaping your students into attentive, well-behaved learners that become your ideal students.Here’s the short version of my First Week plan to establish a classroom community that runs smoothly and sets the stage for top-notch learning. Establishing classroom rules the first week of school is a no-brainer. The ideal student must clearly understand what is expected of him and how he should behave. I always make a plan to introduce my rules and write it out step-by-step, so nothing is forgotten. When I introduce a rule, I’m specific and don’t just talk about it. I model it, both the right way and the wrong way (they love that!). We role play it in a variety of ways: doing it the right way, doing it the wrong way, sometimes I’m the student and the student is the teacher, etc. And then we practice, practice, practice every day of the first week (and frequently thereafter). You can read about it in much greater detail HERE. Daily routines include anything else that takes place and how I want it to happen (what it looks like, what it sounds like) – every little nitty gritty thing, including how to enter the classroom and what to do, how to do lunch count, what to do when I’m giving instruction, when and how to sharpen pencils , and every other type of transition. The first week of school I plan our day, step by step, and then teach my ideal students how to do every little thing. Then we practice, practice, practice every day for the entire week (and frequently thereafter). Now last, but not least, is my secret strategy. This strategy I teach in the first week of school is actually part of establishing the daily routine. In fact, it is the routine that sets the tone for the entire day. Years ago I quickly learned that if my students came into the classroom in an orderly fashion each morning, without chaos, and with a meaningful purpose, then they had automatically conditioned themselves to be attentive learners for the remainder of the day. The trick was to come up with the perfect solution to trigger an orderly, meaningful, and eagerly anticipated entry into the classroom every day. If I could do that, it would certainly address the issue of starting the day without chaos, but, remember, it must also be meaningful. This was an opportunity to address the age-old problem of students forgetting the lessons they had learned. I wanted to set them up to be ideal students that had learned and retained what they had been taught. This morning task had to be kept simple, yet just challenging enough to encourage anticipation and confidence that they could demonstrate the right answers (kids love to show what they know when they are confident about it). I wanted my kids to know and remember the important skills I was teaching them, so I made a plan to do just that and to address all of the above criteria at the same time. My Daily Morning Work was born! I kid you not, it has truly been my best strategy for shaping self-reliant, knowledgeable, and confident ideal students. Anyway, as part of establishing my first week routines, I teach my students, step-by-step, how to enter the classroom each morning and complete their Morning Work. We practice it together every day that week (and taper off as they become sufficient at doing it on their own). 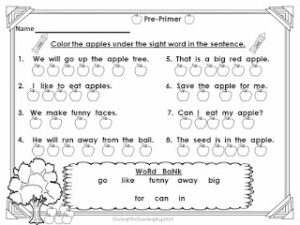 You can be ready for the first week of school with my FREE 1st Grade Morning Work HERE and/or my FREE 2nd Grade Morning Work HERE. Enjoy! Here’s to wishing you a great year with a room full of ideal students! 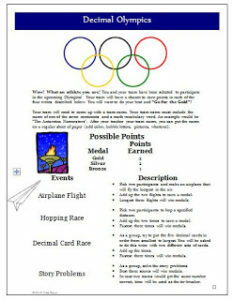 This post originally appeared on Primary Teachspiration. Hi, I’m Anita, teacher-author of Primary Teachspiration. I love creating and blogging about inspirational and practical ideas for the primary classroom. My motto is, “Be prepared and keep things simple.” For me, that is the best way to run a stress-free classroom. For example, by focusing on creating effective resources that are simple and spiral throughout the year, I’ve reduced reteaching and my kids learn and retain so much more. Also, finding simple ways to prepare ahead makes teaching so much easier. like planning for a substitute teacher. Ugghh! I know, right? So, make sure to get this FREE Substitute Teacher Binder for a simpler, more stress-free year in the classroom.